Doubtless there will be some handwringing over this and a few scapegoats will be punished. But, really, is it so surprising? 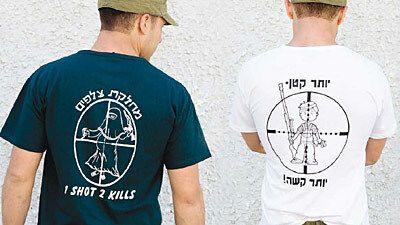 The sentiments on the shirts are merely a slightly more overt version of the discourse pushed by right-wing commentators all around the world — all Palestinians are terrorists and they deserve to be collectively punished. Ultranationalist Russian émigré Avigdor Lieberman has been tapped to be Israel’s new foreign minister. Lieberman’s penchant for diplomacy is demonstrated by his recent call for the President of Egypt to “go to hell,” and his suggestion that the conflict in Gaza would best be resolved by dropping a nuclear bomb on its inhabitants.